Can your computer monitor stand be adjusted to allow you to work sitting or standing? Wouldn't you like to have this versatility? Learn how you could improve comfort dramatically with desk mounts and a sit stand workstation. Those who work with computers for prolonged periods of time might want to have their computer displays at eye level for the most comfort. Unfortunately, this might not be possible, in all work environments. One can think of a dentist who has his hands full holding the patient's mouth open. Or, the auto mechanic might be on a "creeper" under a vehicle. A security guard might have multiple monitors to watch. Instead of trying to crane their necks into uncomfortable positions, it might be easier to purchase an ergonomic sit stand dual monitor arm. When there is only one employee in the convenience store, then a Cotytech sit stand dual monitor arm might be ideal. Workers can multitask with these monitor mounts. Most workers will spend the majority of their time sitting and typing away at their keyboard. Unfortunately, some workers - like bank tellers and nurses - might need to stand for prolonged periods of time. A hospital could use a versatile sit stand cart to take vitals. When the next shift arrives, their required tasks might be completely different. Instead of investing in multiple types of computers, why not purchase one adaptable desk mount? That way your work environment gains multi-purpose functionality. Stay-at-home mothers might also want a versatile sit stand monitor arm. This allows for them to watch their babies, cook dinner and watch their favorite soap operas. Our Cotytech ergonomic computer display mounts can be used for the office or home. You can expand the functionality of your office sit stand workstation dramatically. A Cotytech sit stand monitor mount might be perfect for those who rent out common work cubicles to entrepreneurs. This allows for the small business owners to adjust their displays to complete a variety of types of projects. Cotytech gives you a versatility edge. Every business is looking for a competitive edge. With Cotytech sit stand monitor desk mounts, you can create a more comfortable work environment. When your workers are more comfortable, they will be happier and more productive. 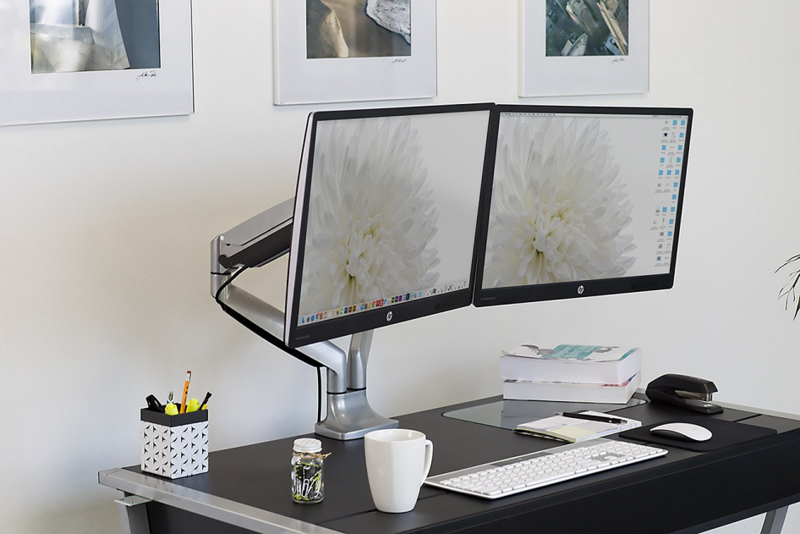 Create a great work environment with a Cotytech sit stand dual monitor arm.